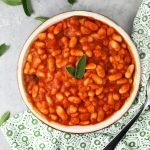 Fagioli all'uccelletto (beans in tomato sauce) is a delicious Italian side dish made with cannellini beans, tomato, garlic, and sage. Incredibly simple and great with steak, chicken or sausages. Add the olive oil to a saucepan. Crush the garlic cloves with the back of a knife and add to the pan with the sage. Fry for one minute then add the passata. Add a pinch of salt and pepper and let it simmer for 10 minutes. Add the water and the beans and let it cook down for another 5 minutes. Please note this recipe was tested and developed using metric measurements all imperial measurements are an approximate.